Imagine a swarm of remote-controlled microrobots, a few micrometers in length (blood-vessel-sized), unleashed into your body to swim through your intestinal track or blood vessels, for example. Goal: to diagnose illness and treat it in hard-to-reach areas of the body. An international team of researchers, led by the Chinese University of Hong Kong, is now experimenting with this idea (starting with rats) — using microscopic Spirulina algae coated with biocompatible magnetic nanoparticles to form the microswimmers. There are two methods being studied: (1) track the microswimmers in tissue close to the skin’s surface by imaging the algae’s natural luminescence; and (2) track them in hard-to-reach deeper tissue by coating with magnetite (Fe3O4) to make them detectable with magnetic resonance imaging (MRI). The devices could also sense chemical changes linked to the onset of illness. 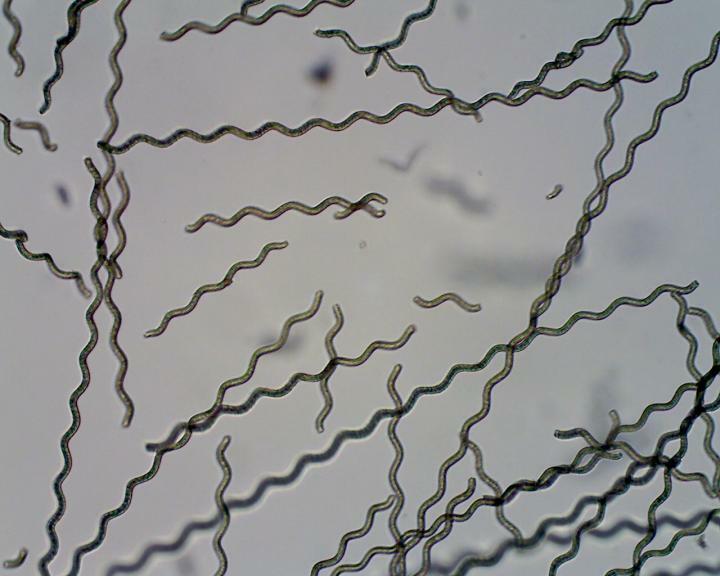 In lab tests, during degradation, the microswimmers were able to release potent compounds from the algae core that selectively attacked cancer cells while leaving healthy cells unharmed. Further research could show whether this might have potential as a treatment, the researchers say. The study, published in an open-access paper in Science Robotics, was carried out in collaboration with the Universities of Edinburgh and Manchester and was supported by the Research Grants Council of Hong Kong. Magnetic microrobots and nanorobots can be remotely controlled to propel in complex biological fluids with high precision by using magnetic fields. Their potential for controlled navigation in hard-to-reach cavities of the human body makes them promising miniaturized robotic tools to diagnose and treat diseases in a minimally invasive manner. However, critical issues, such as motion tracking, biocompatibility, biodegradation, and diagnostic/therapeutic effects, need to be resolved to allow preclinical in vivo development and clinical trials. We report biohybrid magnetic robots endowed with multifunctional capabilities by integrating desired structural and functional attributes from a biological matrix and an engineered coating. Helical microswimmers were fabricated from Spirulinamicroalgae via a facile dip-coating process in magnetite (Fe3O4) suspensions, superparamagnetic, and equipped with robust navigation capability in various biofluids. The innate properties of the microalgae allowed in vivo fluorescence imaging and remote diagnostic sensing without the need for any surface modification. Furthermore, in vivo magnetic resonance imaging tracked a swarm of microswimmers inside rodent stomachs, a deep organ where fluorescence-based imaging ceased to work because of its penetration limitation. Meanwhile, the microswimmers were able to degrade and exhibited selective cytotoxicity to cancer cell lines, subject to the thickness of the Fe3O4 coating, which could be tailored via the dip-coating process. The biohybrid microrobots reported herein represent a microrobotic platform that could be further developed for in vivo imaging–guided therapy and a proof of concept for the engineering of multifunctional microrobotic and nanorobotic devices.